Terra cotta pots are one of the single most versatile household items. These are not only ideal for planting flowers, but also, to convert into fountains, make wonderful outdoor aesthetic decorations, and serve many more purposes. What you might not know is just how durable clay pots really are and what they can be used for, other than plants. In fact, these are so versatile and durable, they date back to antiquity, used for storing food, grain, and many other items. A little known fact about clay pots is they are the reason for the word, “insincere.” While that might sound quite strange, even fantastic, it’s nonetheless true. When a potter made a clay pot that wasn’t up to standards, it could be revealed by holding it up to the sunlight. If there was a defect in the glaze, it would be apparent, and the phrase “insincere” was used to describe it. Today, terra cotta is still very popular, precisely because of its simplicity and many uses. They can hold plants, water, and be used indoors and outside. 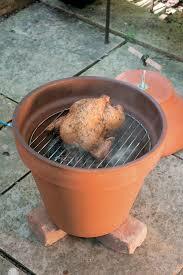 One surprising use it to convert a clay pot into a smoker. Before you think it’s too difficult and requires tools, you can make a clay pot smoker in a short amount of time, and, with little effort. You don’t need a big work space or specialized skills, just a terra cotta pot and a few materials. One great thing about landscaping is the fact that you can use all kinds of common household items for different purposes. For instance, you can take an old wood ladder, give it a good sanding, brush on a coat of paint, and now, you have shelving for plants. An unstable wooden chair can make a great porch swing. Just saw off the wobbly legs, fasten four eye hooks to the chair, and then hang it. Old tires can be transformed into planters, while an old bed headboard can be made into an outdoor table. Take the shelves out of an old bookshelf, line it with landscape fabric or plastic, and turn it into a small composting bin. If you use your imagination, you’ll come-up with quite a few uses for old items to give them new life in your landscape. For instance, empty wine bottles can serve as citronella candle holders to keep mosquitoes at-bay when you are entertaining. Gather needed tools and materials. You’ll need a terra cotta pot (of course), a pot drain pan, a hotplate burner, grill grate, three or four clay pot feet, gate handle, nuts and bolts, drill-driver, grill thermometer, some gravel, and cast iron or stainless steel skillet. Drill holes for the burner wiring, the handle, and thermometer. To start the assembly, drill holes as needed to accommodate the burner and to fasten the gate handle. You should drill the holes a few inches from the bottom on one side of the pot. The handle is optional, as there are many clay pots that come with a cover and handle. One more hole should be drilled into the cover to accommodate the thermometer to easily monitor temperature. Attach the legs to the bottom. Turn the pot upside down and attach the legs. You’ll have to drill holes into the bottom if the pot is not already equipped with legs. As an alternative, you can skip attaching legs and just set the pot on bricks. Fill the bottom with loose gravel. To keep the bottom in-tact, it needs to be insulated with loose gravel that will support the burner. Place the burner on top of the gravel and feed the wires through the holes you drilled in the side. Then, place the skillet on top of the burner–this is where the wood chips will go when you’re ready to cook. Fix the grill grate into place. Now, you can place the grill grate inside the pot, pushing it down until it is snug. There ought to be some space between the skillet and the grill grate, enough to accommodate wood chips but not much more. That’s all you need to do to make a smoker out of a clay pot! Now, you can smoke your meat and enjoy the wonderful slow-cooked taste.